Each province was ruled by its respective king. cialis canadian pharmacy Sometimes one man would rise above all the others and become “High King” of all of Ireland. Such was the case with Brian Boru. His nickname, Boru, came from the old Irish word, “Boruma” which might have meant “Of the cattle tribute”. He was the King of Munster and was a great and feared military leader. 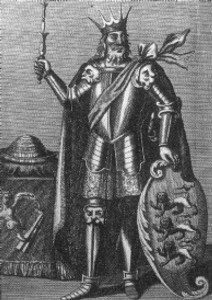 Brian Boru is credited with having vanquished the Viking invasion and foreign occupation of mainly Leinster and Dublin. Because of his having united all five provinces and having conquered the Vikings, he was recognized and proclaimed as “High King” of all Ireland. Unfortunately, it was at the Battle of Clontarf on April 23 1014, in which he defeated the Vikings, he himself was killed. Brian Boru has become an Irish national hero. Later, Irish Nationalists would hold him up as an example of an Irish leader defeating foreign forces. here As an Irish national cultural hero, Brian Boru is associated with the creation of the national symbol, the “Brian Boru Harp”, which is proudly worn on the black berets of the Brian Boru Pipes and Drums. follow site In recognition of his great and important contribution to Irish history and spirit of nationalism, we are most humble and proud to dedicate the name of our band to him: see The Brian Boru Pipes and Drums! !